You are here: Home / Featured / Gifts For Horse Lovers: Casual Style They’ll Love All Year Round! Gifts For Horse Lovers: Casual Style They’ll Love All Year Round! If you’re looking for great gifts of horse jewelry that cost less than $100, you’re going to love this week’s blog! We’re featuring on some of the best-selling, most wearable pieces of horse jewelry in the collection to help make gift giving easy! 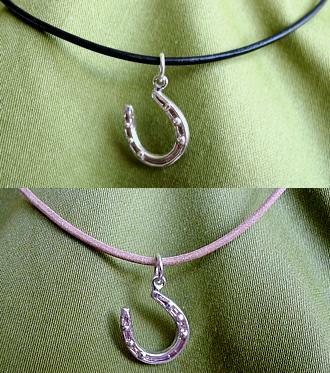 A lucky sterling silver horseshoe charm makes the perfect pendant for the horse lover in your life. 1/2″ by 1/2″, this pendant is perfectly sized for everyday where. Available with your choice of black or natural leather cord. 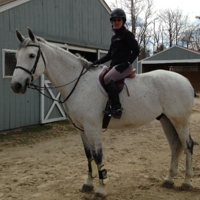 Great for teens and young riders. Choose from 16″ or 18″ length. Only $68! Looking for the perfect gift for the Dad who loves horses? 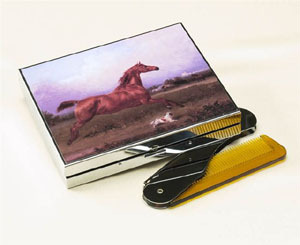 This Chestnut Horse Men’s Grooming Kit features a beautiful horse on the top and contains scissors, a razor, nail clippers, toothbrush, comb and a screw driver. Best of all? It’s less than $40! 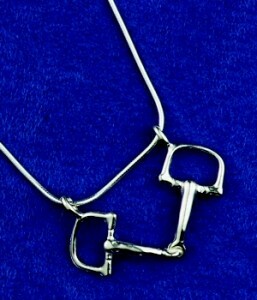 Exuding pure equestrian style and classic design, this necklace features a petite sterling silver bit charm that’s 1 1/2″ across. We’ve enlarged the image here so you can see the detail. This is a very well made piece of jewelry, and can easily be worn everyday. Budget-friendly too: only $58 to put a smile on the face of the horse lover in your life! 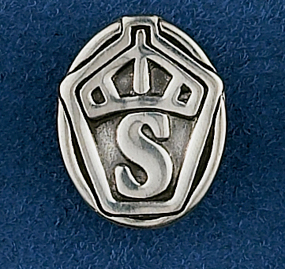 Shown here with the Swedish Warmblood symbol, we also have tie tacks featuring the Dutch Warmblood, Trakehner, Hanoverian, Oldenberg, and Holsteiner symbols. They’re approximately 3/4″ across, proudly made in the USA, and cost less than $50! We had to have something in here for the dog lovers! 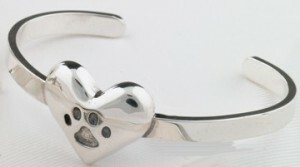 The Paw Print on Your Heart motif is one of our best sellers, and people absolutely love how wearable the sterling silver bangle bracelet is. It fits a wrist between 6 and 7.5″, and is slightly adjustable. Made in the USA! Put it under the tree for only $88.